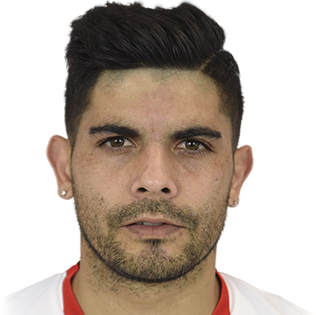 Argentine soccer player Ever Banega is currently playing as a midfielder for National Team of Argentina and La Liga club Sevilla FC. Before heading to Sevilla in 2017, he played for Boca Juniors, Valencia, Atletico Madrid, and Internazionale. Marcelo Simonian is the agent of Ever Banega. He is the member of the Boca Juniors that won 2007 Copa Libertadores. What is Ever Banega known for? An Argentine professional football player who currently plays for La Liga club Sevilla FC. His technical skills, dribbling ability, quick feet, vision, and accurate passing. Where is Ever Banega grew up? Ever Banega was born in Rosario, Argentina as Ever Maximiliano David Banega. His birth sign is Cancer. Reviewing his nationality, Banega is an Argentine. His nickname is Ever. 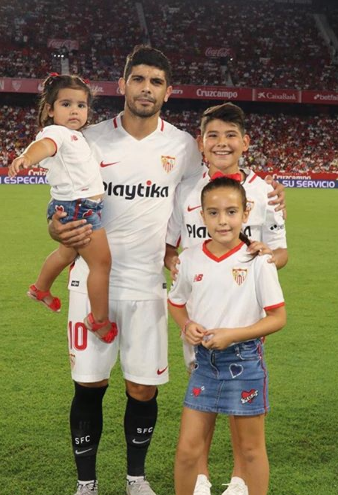 Banega was born to his father Daniel Banega and to his relatively unknown mother and grew up with his four brothers named Luciano, Cesar, Emiliano, and Brian. There is no information about his education details. In the case of disclosed, we will let you know. When did Ever Banega pursue his football career? Following his youth career, Ever Banega played for Nuevo Horizonte, Alianza Sport, and Boca Juniors. He played for Juniors from 2000 to 2007. Banega began his football career at the "Alianza Sport" school for children in Rosario. At age 16, he moved to the Boca's sixth division as a defensive midfielder. Later, the technical coach Alfio Basile, amazed by his talent and ability and his performance in the Primera Division, to play it up to train with the first team, in which he joined with Miguel Angel Russo in 2006. Later, Banega was named in a senior team despite his young age after Fernando Gago transferred to Real Madrid in January 2007. He debuted professionally for the Boca Juniors against Club Atletico Banfield on 10th February 2007, a match that ended with Boca winning 4-0. Banega was transferred to Spanish side Valencia CF on January 5, 2008, with the transfer fee £16.20 million on a five-and-a-half-year contract. His first match came as a substitute in a 0-1 loss against Atletico de Madrid in the First Division of Spain. Following year, he has been honored with Copa Rey with his team. Banega was sent on loan to Atletico de Madrid by Valencia on 26th August 2008 with the loan fee £1.35million. In July 2009 he returned to Valencia CF when the loan term expired where he scored 1 goal in 24 appearances. During his 2010-011 season, Banega played 28 games (2 goals, 19 starts) as his team held the third position and qualified to the Champions League. Later, he was sent on loan to Newell’s Old Boys on 31st January 2014. Before ending his loan-career he played 14 matches scoring 1 goal. Banega was signed by Sevilla FC on 18th August 2014 with the transfer fee £2.25 million and made his debut match in a 1-1 tie for the last 20 minutes replacing Aleix Vidal. He then became the man of the match against FC Dnipro Dnipropetrovsk on 27th May 2015 during the 2015 UEFA Europa League Final. Banega netted nine goals in 46 appearances during the 2015-016 season. Along with his team, he has been honored with 2014-016 UEFA Europa League. Banega was transferred to Internazionale as a free agent on 6th July 2016 and took number 19 Jersey. Later his first Serie A match came on August 21, 2016, in a 0-2 loss against A.C. ChievoVerona. In a match against Atlanta BC, he scored his first hat-trick in a 7-1 home thrashing Atlanta BC. On July 3, 2017, he landed to Sevilla FC form Inter with the transfer fee £6.30 million. He has so far played 31 games scoring 3 goals. Ever Banega received an invitation for the Argentine U20 team along with Sergio Aguero for the 2007 FIFA World Cup, Canada. He earned his international cap with the Argentina U-20 team in 2007, where he played all seven games in the 2007 FIFA World Cup. Similarly, he played 6 matches for the Argentine U23 squad. Banega earned his senior cap on 6th February 2008, with Alfio Basile in a 5-0 victory over Guatemala. Following year, he played at Olympic Games in Beijing 2008 helping conquer the gold medal. Unfortunately, he was not selected for the 2010 FIFA World Cup in South Africa by Diego Maradona. Banega netted his first international goal in a 1-1 draw away against Bolivia in the 2014 FIFA World Cup qualification. Banega was included in 2015 Copa America Final against Chile where his team loss via 1-4 in a penalty shootout. He was one of the two players who miss penalty. Banega is set to star at this 2018 summer's World Cup in Russia as named in the final squad where he became teammates with the great Lionel Messi on the national team. To whom Ever Banega Married? Reflecting his personal life, Ever Banega is married to his wife, Valeria Juan on May 13, 2016. The couple blessed with two daughters and one son. Their two daughter names are Romanella and Agostini. However, their son name was not disclosed in the media. He is often seen enjoying his holidays on the world’s some of the most expensive destinations. As of now, the pair live a blissful life with their children. There is no rumor to divorce at all. How much net worth Ever Banega accumulated? Ever Banega uses the shoe model of Nike Magista Obra II since 15th May 2018. Back in 2016, he had an estimated market value of £18 million and his current market value is estimated to be around £10.80 million. He is the ambassador of Nike. While Banega was in an Internazionale, Ever Banega was the highest paid player brought in the summer with €3 million per year. Banega earns €81,000 as a weekly wages i.e €4,212,000 in a year and his net worth is estimated to be around $19.4 million. He owns several luxurious cars. His Audi A8 was destroyed after getting caught by fire back in 2012. What is the body statistics of Ever Banega? Observing his body figure, Banega stands at a height of 5 ft 8½ inches tall i.e. (1.74m) and weighs around 72 kg. Similarly, He has a pair of brown eyes and black hair color. His body measure 40-14.5-32 inches including chest, biceps, and waist sizes. Further, his shoe size is unknown. In addition, He is active on Instagram over 473K followers and on Twitter over 612,000 followers.